Memphis, Tennessee, with around 675,000 inhabitants, is best known for being the home town of the King of Rock, Elvis Presley. But this city has much more history and culture then just Elvis. 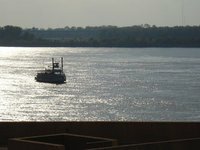 Memphis was founded in 1820 as a center of shipping up and down the Mississippi River. After the Civil War, the city reemerged as the center of the cotton, hardwood and mule industry. Today, Memphis's industrial power comes from being the primary hub for Fed Ex. There is everything in this town from fine southern dining to the excitement of Beale Street. Beale Street claims to be the home of the blues and rock 'n' roll. No matter what its claims are it is still lots of fun every night of the week with live music and street performers. Graceland is the home that Elvis had made for himself. Although the tour does not take you to the more funky rooms, it is still an excellent glimpse into how the King lived. Make sure to go early in the morning so you can get a ticket. Mud Island River Park is an amazing and educational place for people of all ages. Featuring a recreation of the entire Mississippi River and flood plain. Mud island is located at 125 North Front Street, Memphis, TN 38103. For more information call 1(800) 507-6507. National Civil Rights Museum is located in the Lorraine Hotel, where Dr. Martin Luther King, Jr. was assassinated. Memphis in May is a month-long celebration that promotes Memphis's culture heritage. The Beale Street Music Festival is a 3-day music festival usually held in the first weekend of May and is the starting event of a month of events and festivals in Memphis in May. The Levitt Shell in Overton Park is the site of a series of free concerts in spring and fall featuring a performances from a variety of genres. Memphis has a humid sub tropical climate with four seasons. The months of May to October can be very hot while the winter months are usually mild. During the summer there can also be some bad thunderstorms. Daytime temperatures are often between 30 °C and 35 °C during the summer and well above 20 °C at night. Winters are mostly around 10 °C to 15 °C during the day with nights generally above zero though with occasional frost possible. Memphis International Airport (MEM) is located about 3 miles (5 kilometres) south from the CBD of Memphis and has connections to most domestic locations and a limited number of international connections, although there is even a direct daily connection to/from Amsterdam. There are private shuttles companies that provide service to and from the airport. The City of New Orleans, operated by Amtrak, stops in Memphis en route between Chicago and New Orleans. Delta Bus Lines, (Greyhound bus depot) 3033 Airways Blvd (Same location as Greyhound and the MATA Airways Blvd Transit Center at Brooks Rd & Airways Blvd, south of town and northwest of the airport. ), ☎ +1 662 335-2144, fax: +1 662 335-2174. Goes south along US Hwy 278 towards Cleveland, MS via Robinsonville, Shelby, Tunica and Clarksdale. Passengers transfer in Cleveland to continue towards Indianola, Greeneville, Jackson and other places in Mississippi and onwards to Baton Rouge, LA. Greyhound, (bus depot) 3033 Airways Blvd (Same location as the MATA Airways Blvd Transit Center at Brooks Rd & Airways Blvd, south of town and northwest of the airport. ), ☎ +1 901 395-8770, toll-free: 1 800 231-2222. Travels primarily on Interstate 22/US Hwy 78 (Memphis - Tupelo - Birmingham AL); I-40 (Oklahoma City - Little Rock - Memphis - Nashville), with some variations of the route diverging from Little Rock to Dallas Ft Worth on I-30); I-55 (St Louis - Memphis and Memphis - Baton Rouge on two separate routes); and I-55/57 (Memphis - Effingham IL - Chicago). Passengers can transfer buses in Birmingham, Baton Rouge, Chicago, Dallas-Ft Worth, St Louis, Nashville or Oklahoma City to continue to other destinations. MATA bus routes 2 and 4 will take you downtown while route 64 (airport shuttle) takes you to the airport. Megabus, (bus stop) MATA American Way Transit Center @ 3921 American Way (American Way and Getwell Rd). Low-cost carrier offers service to Memphis from Chicago, St. Louis, Atlanta, Birmingham, Little Rock, and Dallas. Fares start at $1 each way when reserved well in advance. Buses stop at the American Way Transit Center, located at the southwest corner of American Way and Getwell Road. This location is several miles southeast of downtown, and public transit service is infrequent; MATA bus routes 36 and 56 will take you downtown while route 64 takes you to the airport. Turimex Internacional, (Bus stop & ticket agency) El Rancherito Market @ 5070 Raleigh LaGrange Rd (Strip mall NE of intersection of Raleigh LaGrange Rd & Covington Pike), toll-free: +1 800 733-7330. I-30/40/55 (Chicago - Memphis - Little Rock - Dallas). Passengers transfer to their other buses in Dallas to continue to other destinations in the US and Mexico. Bus service provided by the Memphis Area Transit Authority (MATA) is available across the city. Some routes are very poorly served in the evenings. At nights and weekends some buses take a different route than during the day which can be a trap for visitors. Charles Vergo's Rendezvous Ribs, according to native Tennesseans, is the best rib restaurant in world. But remember that this place is not vegetarian friendly. Wine is sold in dedicated, licensed liquor stores in Memphis. Most grocery stores may have an "independent" liquor store conveniently next to the grocery store. Apparently this regulation discourages alcohol use by forcing you to walk a few extra feet to buy your booze. High-alcohol-content beers are sold in liquor stores. Traditional brands such as Budweiser are sold in grocery and conveniennce stores only. Hostel Memphis, 1000 South Cooper St (Along Cooper at Felix in SE part of town. ), ☎ +1 901 273-8341. Garden Tree Hotels, 6101 Shelby Oaks Drive (Sycamore View Dr & Shelby Oaks. Off of I-40 at Sycamore View Dr (Exit #12)), ☎ +1 901 937-0503. Offers guests free Wi-Fi and a fitness center. Doubletree Downtown Memphis, 185 Union Ave, ☎ +1 901 528-1800. Located a few blocks from Beale Street; a relaxing accommodation. Best Western Gen X Inn, 1177 Madison Ave. (Madison Ave & N Bellevue, east of I-240 from the downtown medical complex. ), ☎ +1 901 692-9136. Downtown near Memphis Medical Center. Hampton Inn, Beale Street, 175 Peabody Place (SW of Peabody Pl and B.B King Blvd in the historic Beale Street District. ), ☎ +1 901 260-4000, fax: +1 901 260-4012. This is right on Beale Street--as opposed to the Holiday Inn and the Peabody, both of which are a few blocks away. The room prices are average, but beware: it is noisy. If you want to party then this is the place, but for a quieter getaway, stay a few blocks away. Hyatt Place Memphis/Wolfchase Galleria, 7905 Giacosa Place (Off of the Germantown Pkwy exit from I-40 (Exit 16A from the eastbound lanes an 16B from the westbound lanes)), ☎ +1 901 371-0010, toll-free: +1 901 371 9988. Check-in: 3PM, check-out: Nnoon. A hotel located adjacent to Wolfchase Galleria Mall. Offers a pool, 24-hour fitness center, on-site dining and free wifi. Marriott Memphis East, 5795 Poplar Avenue (Off of the Poplar Ave exit from I-240 (Exit 15A, follow signs for Poplar Ave EAST)), ☎ +1 901-682-0080. Check-in: 3PM, check-out: noon. Offers indoor pool, 24-hour fitness center, a restaurant and lounge. Quality Inn, 42 S.Camilla St (Midtown, close to Interstate 240 at S Camillia St & Union St (US Hwy 51)), ☎ +1 901 526-1050, fax: +1 901 525-3219. Check-in: 2PM, check-out: 11AM. Offers good, clean mid-range lodging. Country Inn & Suites, 2270 N Germantown Parkway (Along Germantown Pkwy south of I-40, south of Ikea Way/Varnavas Dr), ☎ +1 901 386-1110, toll-free: +1 800 830-5222, fax: +1 901 386-8801. Peabody Hotel, 149 Union Avenue (Along Union between S 2nd & B.B. King, a couple blocks east of AutoZone Stadium in downtown.). Don't miss the ducks in the lobby fountain and their daily procession (11am and 5pm); you don't have to stay to see them. Luxury extras, sheets and service in a historically and architecturally significant hotel. River Inn of Harbor Town, 50 Harbor Town Square (NE of the A.W. Willis Bridge and Island Dr roundabout at west end of A.W. Willis Bridge on Harbor Town Island), ☎ +1 901 260-3333, toll-free: +1-877-222-1531. Overlooks the Mississippi River, offering luxury in a delightful boutique hotel atmosphere. Located at 50 Harbor Town Square. Experience warm hospitality and unmatched service. The Madison Hotel, 79 Madison Ave (Madison & S Center Ln in downtown), ☎ +1 901 333-1200. Located downtown near the river, is a modern boutique hotel with a clean lines, contemporary vibe and stylish luxury. The Madison Hotel was awarded Number One Small Luxury Four Diamond Hotel in Memphis. Make sure not to miss Grill 83--located at street level--with its excellent seafood, steaks, and martini lounge, and the sweeping rooftop garden with breathtaking views of downtown and the Mississippi River. The University of Memphis, Tennessee is a state university with a very good basketball team. We have a comprehensive list of accommodation in Memphis searchable right here on Travellerspoint. You can use our map to quickly compare budget, mid-range or top of the range accommodation in Memphis and areas nearby. This is version 46. Last edited at 11:25 on Dec 3, 18 by Utrecht. 47 articles link to this page.